Every day we get calls for estimates from customers that actually do not know which product they want. Vinyl fencing? Wood privacy? What are the pros and cons? So we are going to give you some details on each product to help you decide which is right for you. Most customers, the vast majority for us at Pro Fence Grand Rapids, are buying their fence to secure their yard for their new puppy or children. If you are looking for a product that is simply for these reasons and on a budget, chain link is the product for you. It comes in Black Vinyl chain link, green, brown, and standard galvanized. The Vinyl coated products are more expensive, but are also much more attractive. This product seems to last forever, and if built correctly, will last decades. It is maintenance free. It comes in heights from 3′ tall to 6′ tall (for most residential applications). And it’ll usually cost between $8 and $10 per linear foot (terminal posts and gates are extra) for a standard 4′ tall application Because we install every post in concrete and all posts are set no more than 8 feet apart we guarantee this product as long as you own your home. For customers that are looking for basic privacy, 6′ tall wood fence is an excellent choice. If well taken care of it can last decades, it is affordable, and can be very attractive so long as your contractor uses a good quality wood. In our Michigan market we install mostly pressure treated pine, and cedar. Most companies in the Grand Rapids area market offer it in two grades of picket thickness, 5/8″ and 3/4″. You get what you pay for. The 3/4″ picket is definitely the superior product, as the thicker board is more resistant to cupping, twisting and warping. You can expect to pay $14 to $20 per linear foot (installed) for basic dog eared wood privacy. And any fence company that is worth hiring will never sell you prebuilt sections. If you wanted junk you’d go to any box store and buy it and do it yourself. Obviously wood is not the kind of product that comes with much of a guarantee, but any good company will guarantee their post footings and be happy to take care of you should your fence experience any serious warping within the first year or two. Ornamental Aluminum is my personal favorite. Because it is aluminum you’ll not have to worry about rusting. Depending on the manufacturer, the paint finish (offered in many colors) tends to stay beautiful and vibrant for may years, and this is another product we guarantee as long as you own your home. We offer aluminum by Alumigard and Elite. This particular product is often the choice of many folks looking to secure their pool, or customers that have a Victorian Home and are looking for a more distinguished look. You can expect to pay anywhere from $22-$30 per linear foot (installed) for this product in four foot height, depending on the style you choose and company installing it. If i could do only product for the rest of my life, it would be ornamental aluminum. Vinyl fencing is becoming more of a popular choice in the Grand Rapids, Holland, Grand Haven, and Muskegon areas. It is strong, long lasting, beautiful, and it is also 0ne of the most expensive residential fence products you can buy. It is offered in multiple colors, but white is the most poplar. Keep in mind that this is basically a plastic product, and when installed for privacy it becomes a sail against heavy winds. It gets brittle when cold. If you live in a high wind area, full privacy may not be a a great choice, we have actually had to replace one installed by a competitor that blew away due to the posts bending straight over in straight line winds. 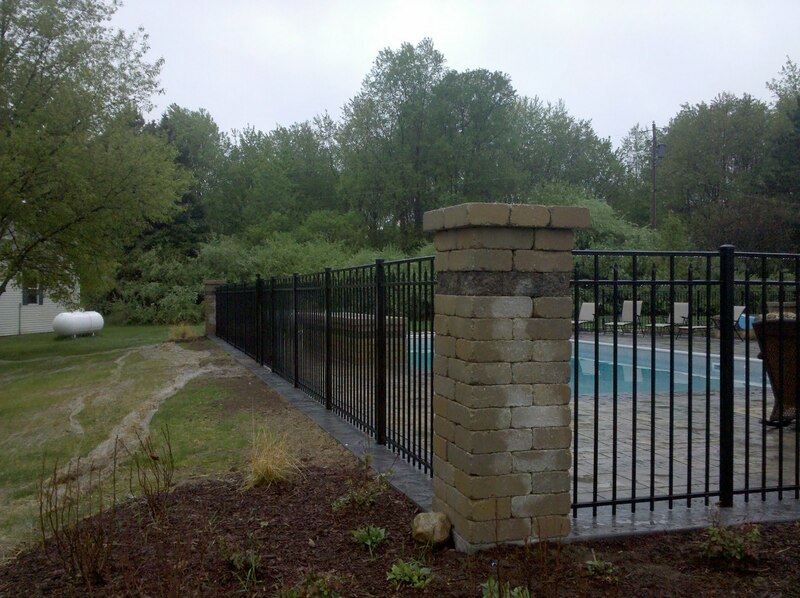 We offer vinyl (also known as pvc) fence by Bufftech, we feel this is an excellent product. If you choose a competitor product we recommend you choose a company that offers Digger Specialty, another excellent product. We cannot recommend anything else, and suggest you stay away from box store vinyl fences for quality reasons. Vinyl fence is offered in a couple dozen different style, many of which can be seen in the gallery on our website or on our Google+ page at https://plus.google.com/+ProFenceWyoming. Again, we guarantee this product as long as you own your home. You can expect to pay anywhere from $15 to $50 per linear foot (installed) for this product depending on the height, style, manufacturer, and contractor.